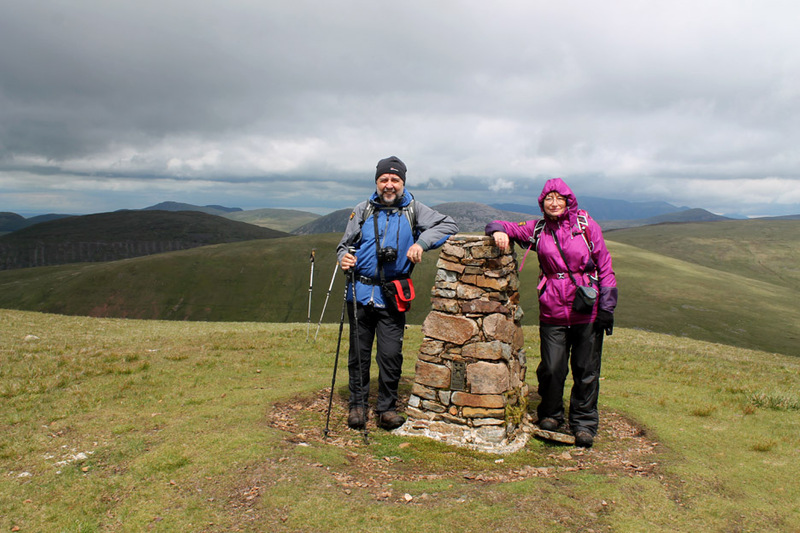 " Whoap and Lank Rigg with Jill & Nigel "
Date & start time: Monday 22nd June 2015, 11.50 am start. 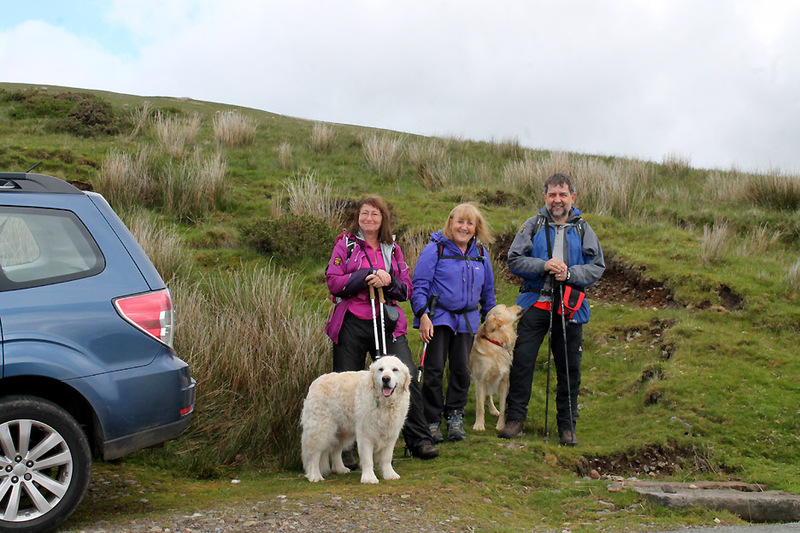 Places visited : Upper Calder valley, Whoap, Lank Rigg, Latterbarrow Moss and back. 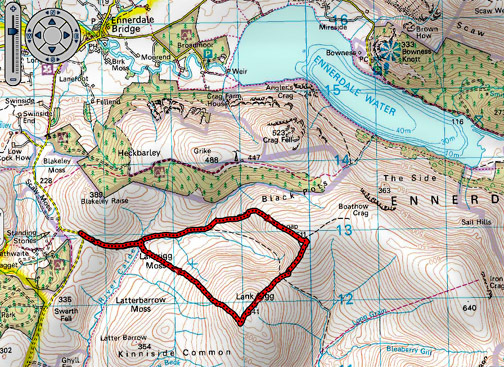 Walk details : 5.3 mls, 1500 feet of ascent, 4 hour including lunch. 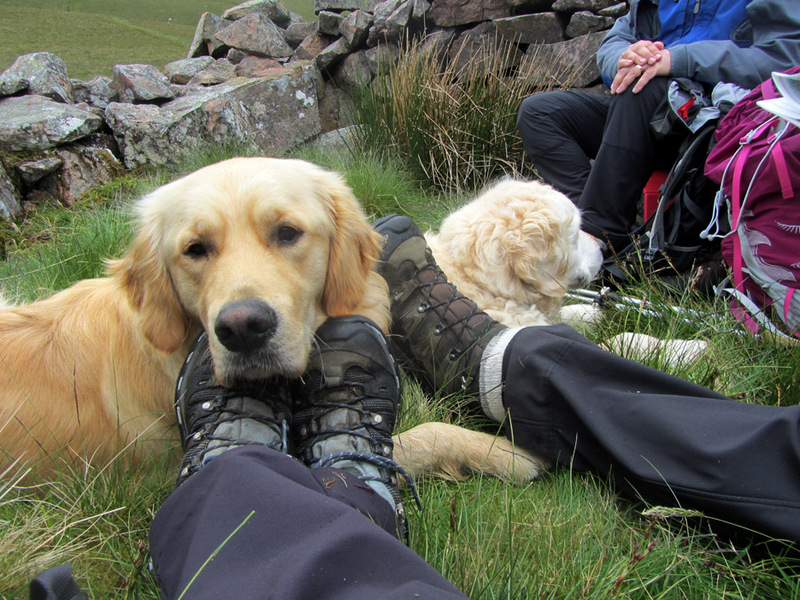 Walked with : Jill, Nigel, Ann and our dogs, Harry and Dylan. Weather : Summer cloud but not summer temperatures. 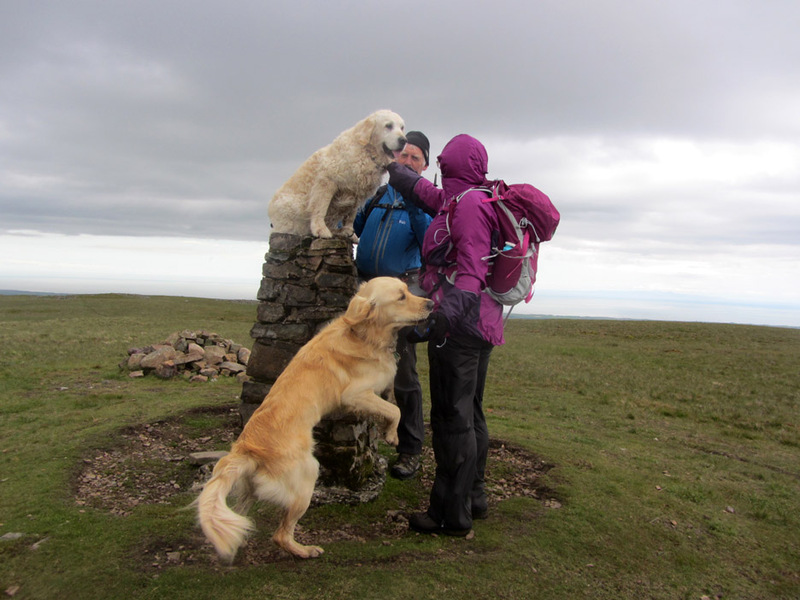 and our invite today was to the western fells to join them on their way to another Wainwright summit. Always chance of a second "reward" on the top according to the book. The team today . . . Jill, Ann and Nigel. 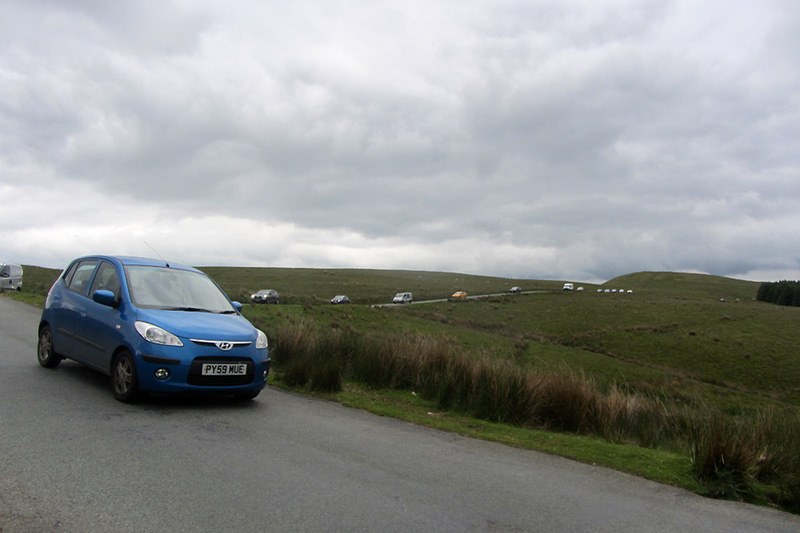 We park at the high point of the Cold fell Road, close to Blakeley Rise. The track towards Lank Rigg climbs a short distance before dropping into the Calder Valley. Looking back from the top of the rise we can look west to the Irish Sea with Dent Fell in the centre of our view. 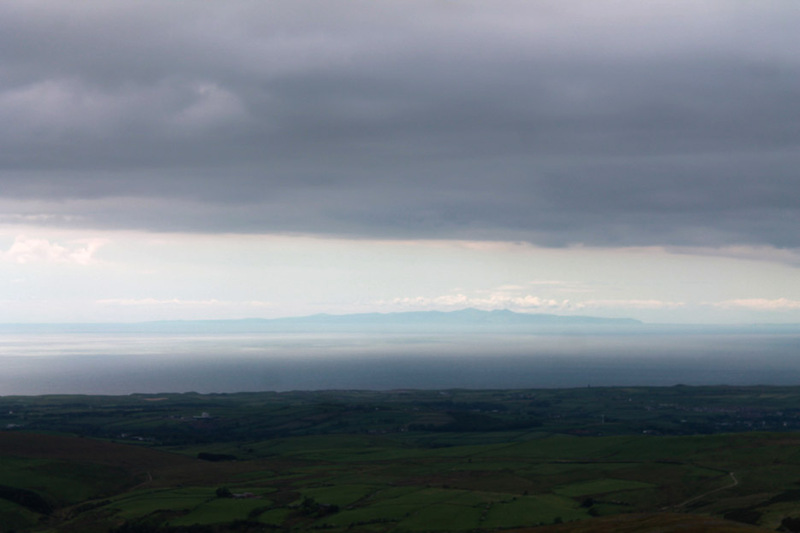 The distant white cloud away to the left is building over the Isle of Man, the right is cloud over Scotland. Ahead are our two planned summits for today . . . Whoap on the left and Lank Rigg on the right. 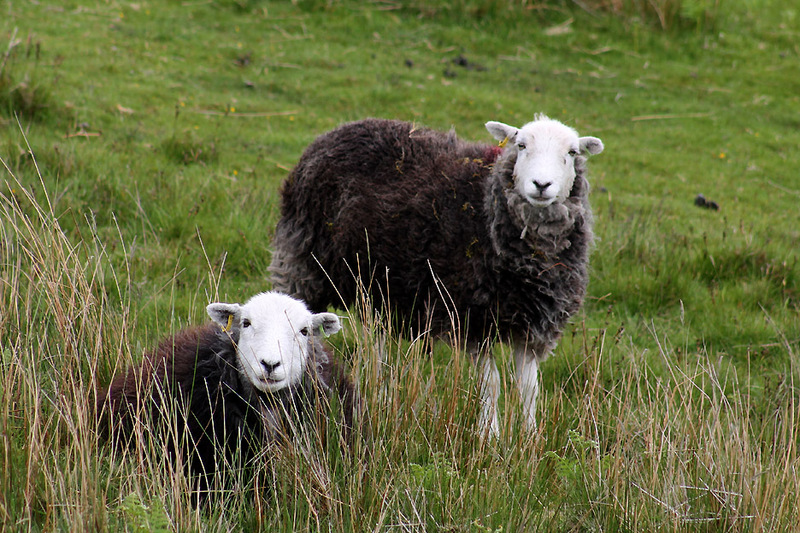 Classic Herdwick sheep on the open fell. 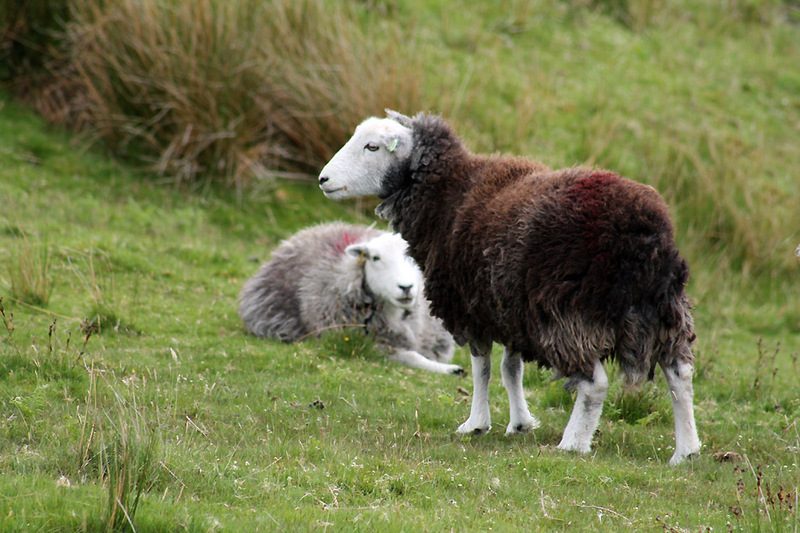 where sheep are often ruddled, dressed in red ochre, to make them look their best. Two more . . . as attentive to me as I am to them. 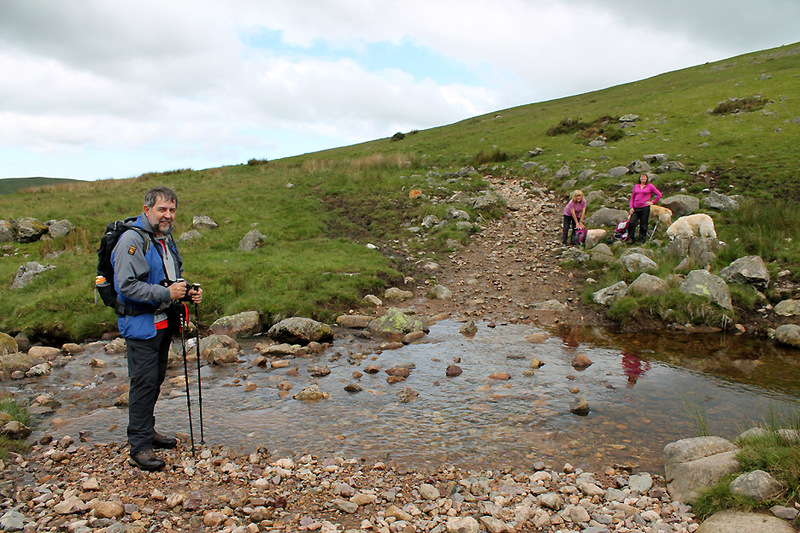 The first stream crossing of the day . 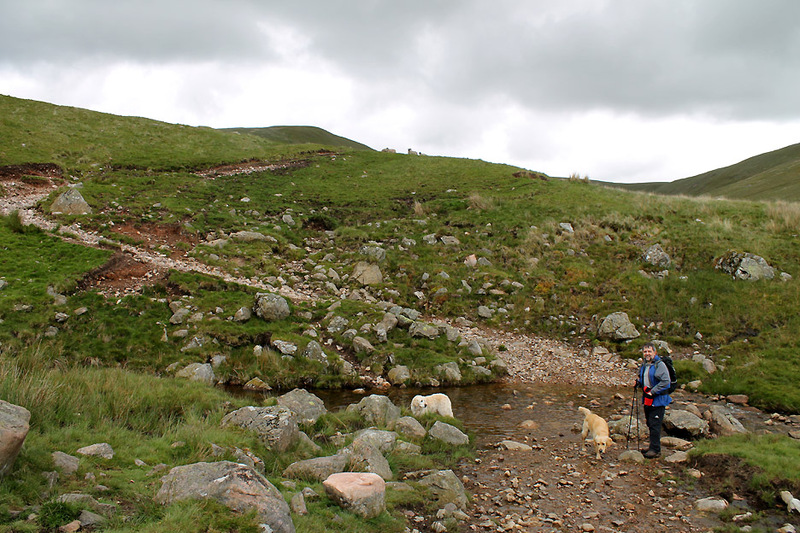 . . the tributary of Stinking Gill, coming down off Grike Fell. It joined the infant River Calder and heads for the sea via Calder Bridge. 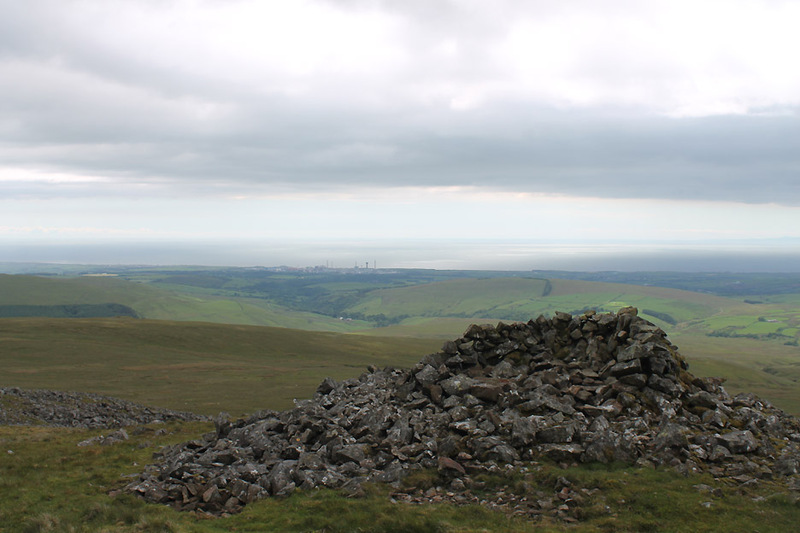 The original name for the Sellafield Nuclear plant was Calder Hall of course. Stop the press for a moment . . . late news has been received ! A minor correction to your blog of the day. The original name of the Sellafield Nuclear Plant was Windscale when I joined in 1956. Limited, Sellafield in 1971 (I think that is the correct date). Hope you don't think this is a criticism as I really enjoy your pages. Thanks Trevor ... no indeed ...very useful information as the names have changed several times over the years and it can get quite confusing. RmH. The second crossing is the actual River Calder which has turned across us and rises behind Whoap. In the shelter of the valley the walking has been rather warm and so the girls shed a layer of clothing. Yes . . . that's sunshine chasing us up the fell side. 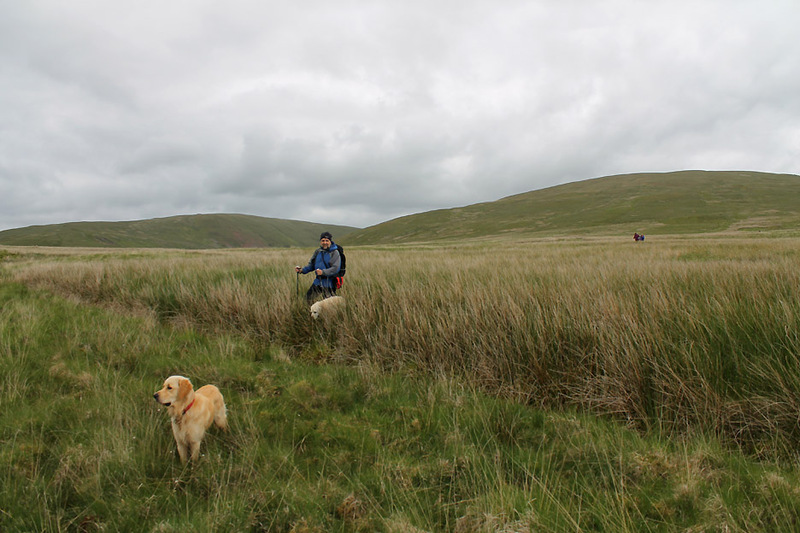 The walking up here is classic moorland grass with a farmer's track up the slope keeping the grass slightly shorter. Occasional longer, more reed-like grasses highlight the wetter patches that need to be avoided. Zooming in on Criffel on the Dumfries and Galloway coast. 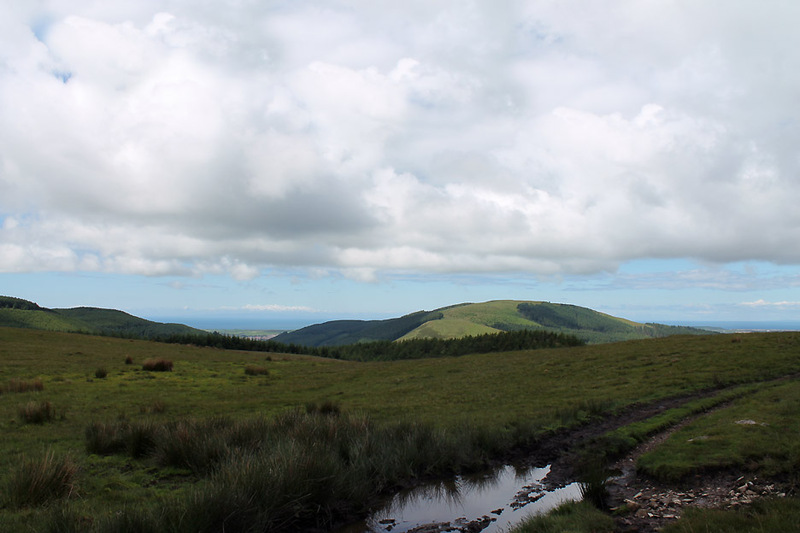 Criffel and ourselves are in sunshine but Grike and Crag Fell in between are not. Note the mast of the Grike weather station above the cleared forestry . . . it also monitors the air for any traces of air borne nuclear pollution. Looking north east we see the multi-coloured ridge of Great Borne, Starling Dodd, Red Pike and High Stile . . . with Grasmoor behind. On the way to the summit of Whoap . . . an erratic boulder providing foreground for another wide-angle shot. 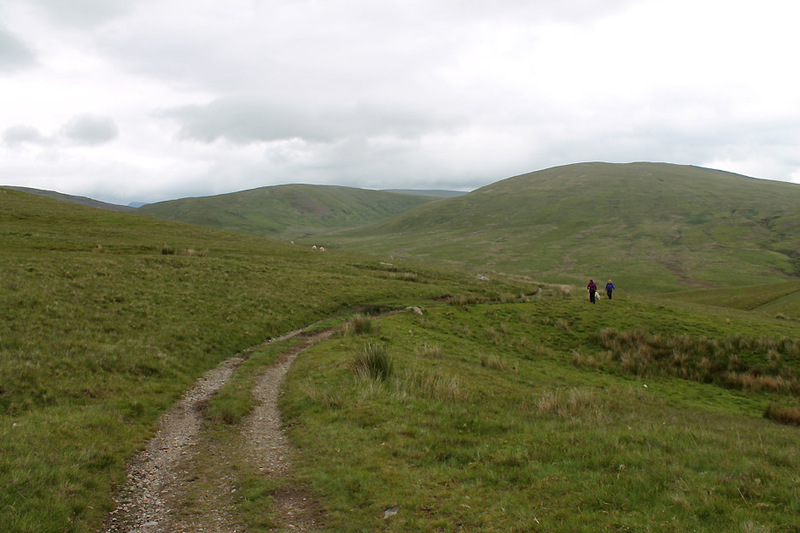 From the top, the way on towards Lank Rigg is highlighted by a small path. You could call it a sheep track but I bet it is used by a fair number of Wainwrighters heading out to the 2nd most westerly summit in the book. 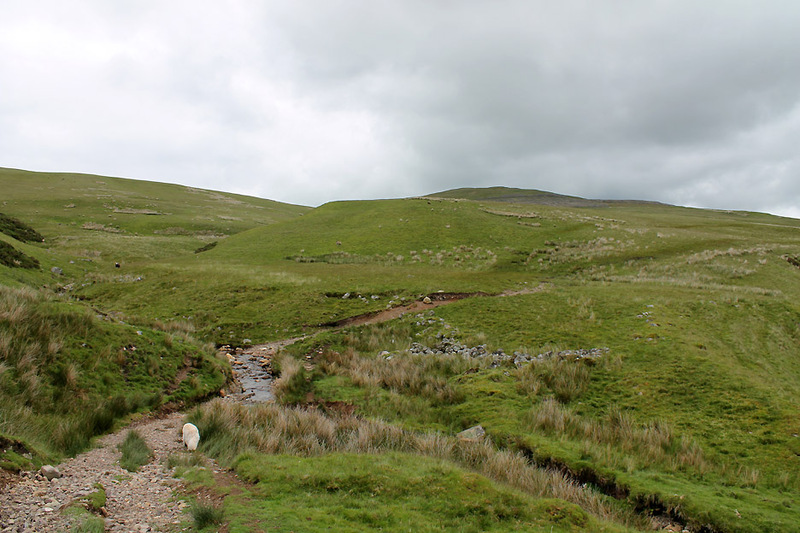 The u-shaped valley of Whoap Beck becomes the Calder Valley half way down towards the bend. 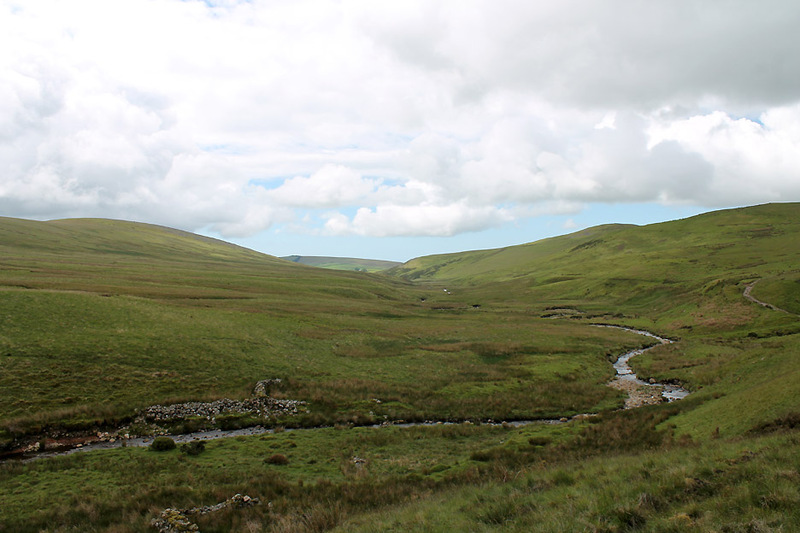 The valley can't just have been formed by this small stream . . . it must be glacial. Whatever the reason, the wide, flat valley demands a wide-angle photo again. and increased in speed. It now hits us side on as we cross between the two fells. 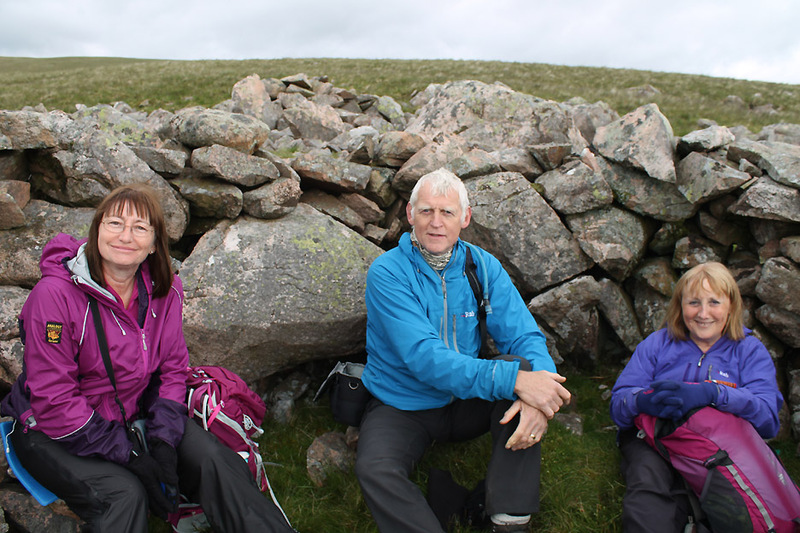 It is lunchtime, so with no other shelter in sight we head over to this outcrop which contains an old sheep fold within it. Warmly tucked away behind the walls as the wind blows over our heads. Time for a little something to eat . . .
. . . not forgetting their lunch too. We were passed by the only other person we saw today as we sat tucked away in the shelter. 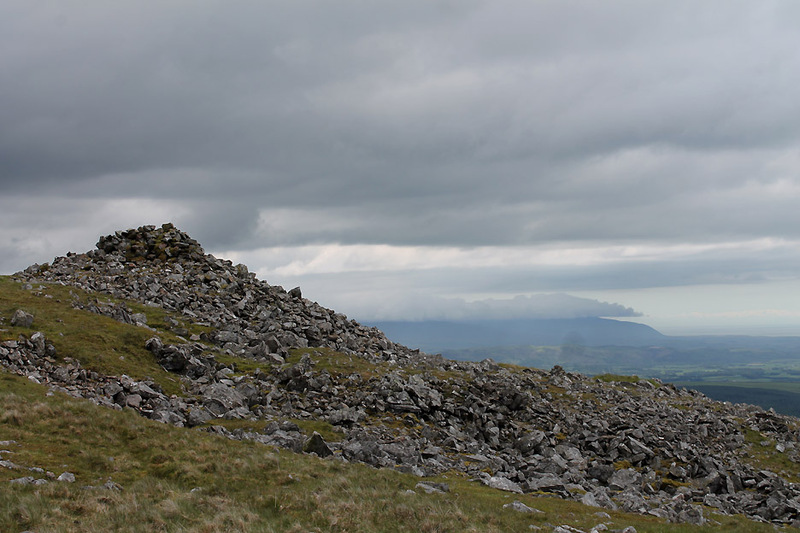 there is a steady pull up the grassy slope towards the summit of Lank Rigg. 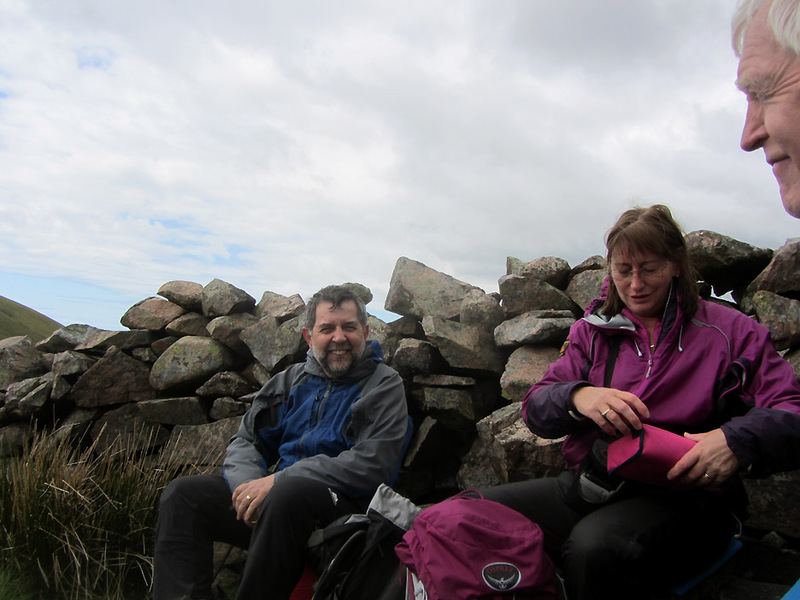 Topping out in stile . . . ears blowing in the strong north-westerly wind. 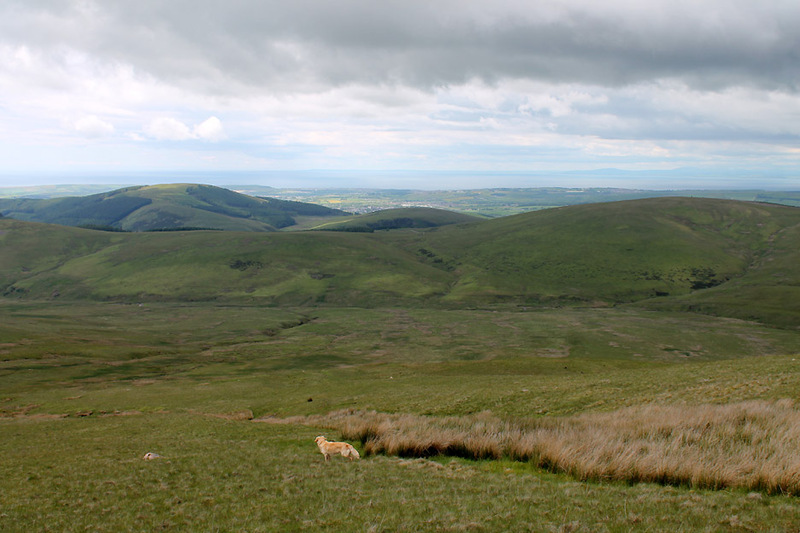 This was the view from the top looking south to Black Combe in the distance. Not to be outdone, Harry gets his turn at the high chair . . . only he had to be helped up due to his more mature age. Me, me, me, . . . I want to climb it again ! and if no-one had found it he would claim it back and buy himself some fish and chips . . . it was a reckless thing to do anyway "
He gave readers a clue . 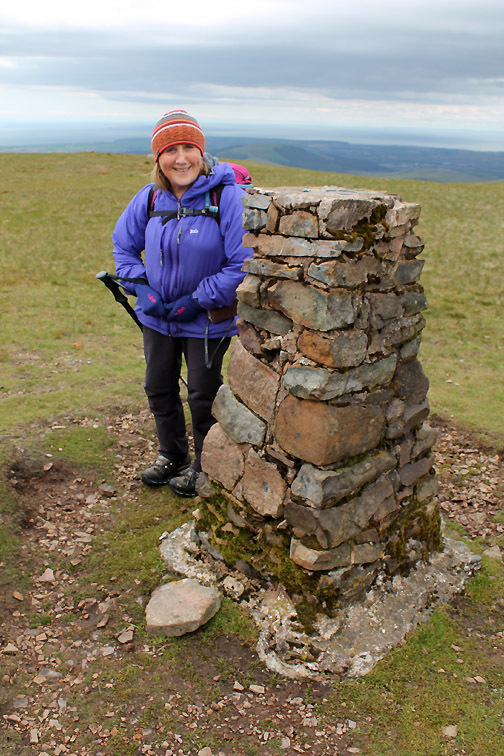 . . look for a flat stone 4 feet from the trig. The original coin has long gone . . .
but we thought we would check . . . 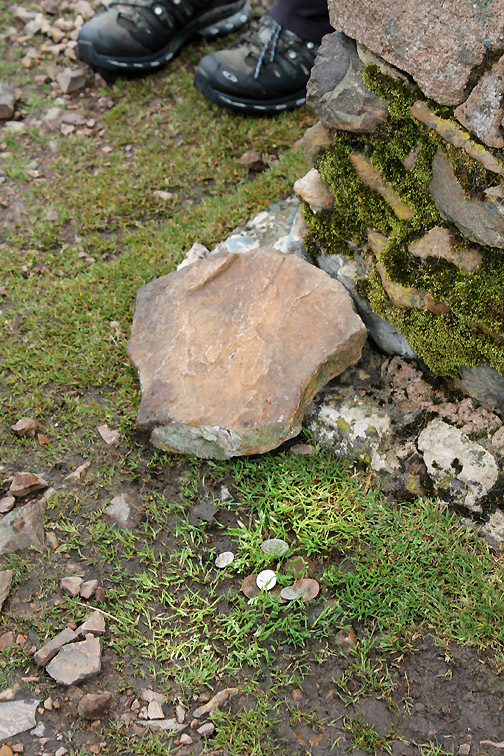 The coins more recent in date (post-metrication) and the stone in the wrong place . . .
but the concept lives on, a living testament to the love and appreciation walkers have for the man and his ideas. 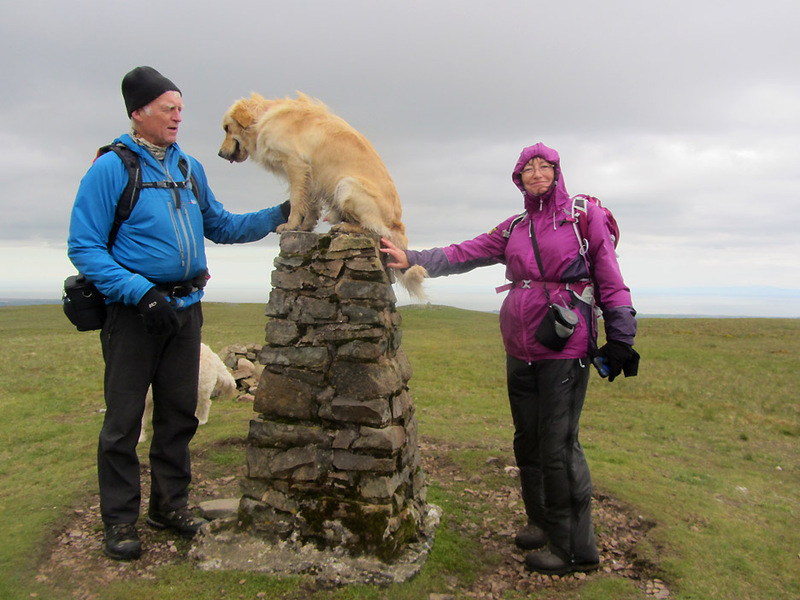 was to celebrate the ascent of Jill and Nigel's 188th Wainwright top. 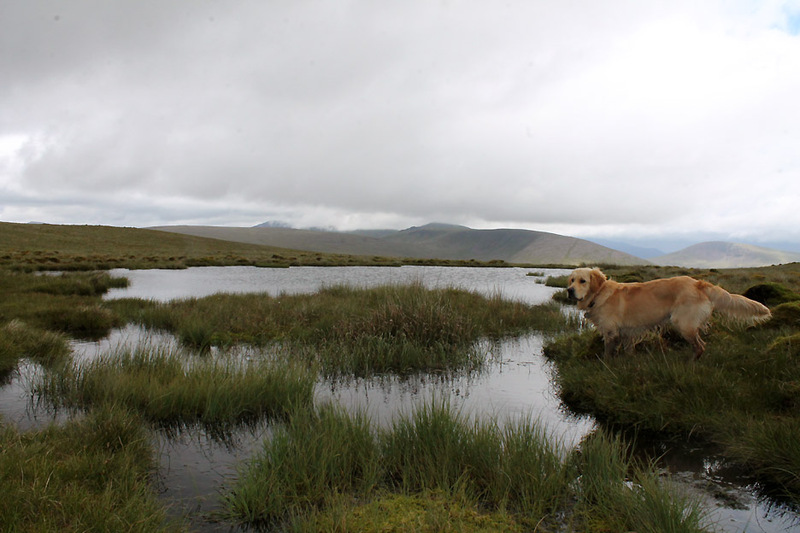 Just south of the summit is a delightful shallow tarn, unnamed on the map. 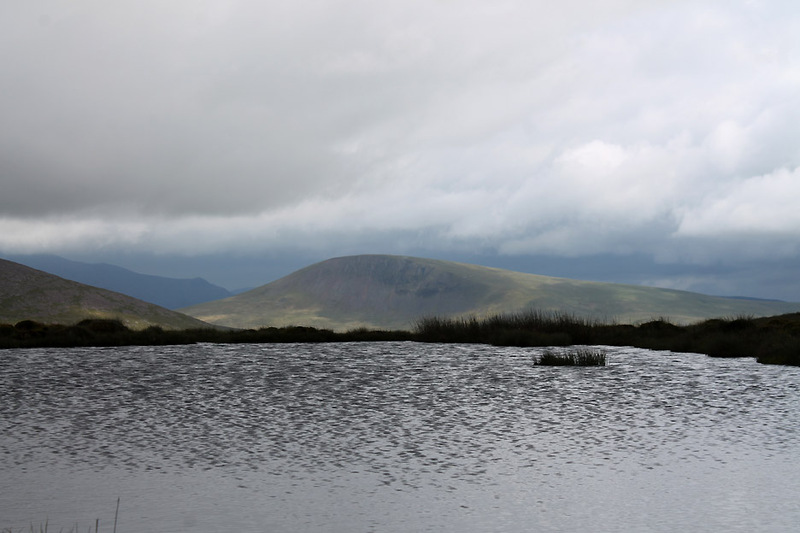 We shall call it Lank Rigg summit tarn. It gives fine reflections of the view over towards the central fells on a calm, blue sky day. 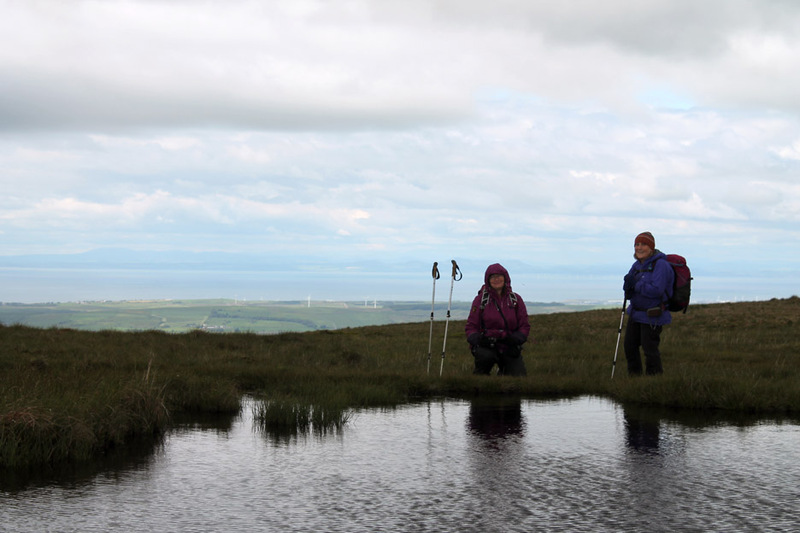 Today the reflection of Seatallan will have to be left to your imagination. 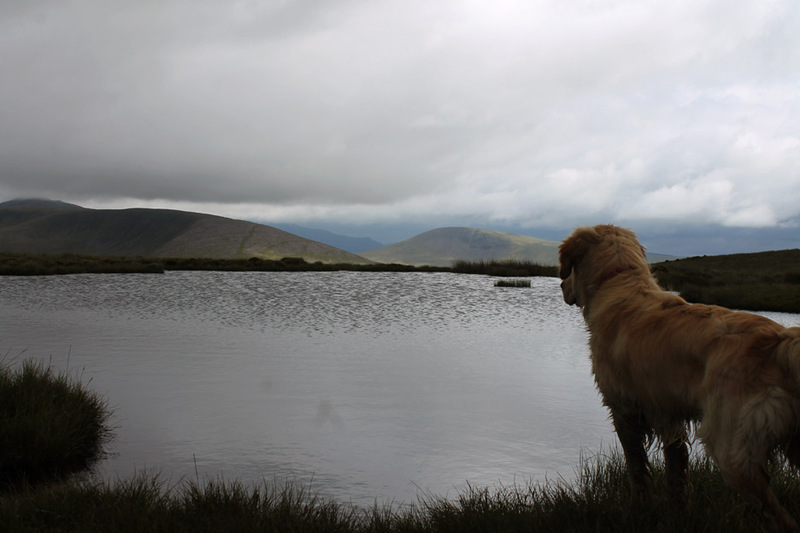 There's a boggy bit by the edge of the tarn . . . is Jill kneeling for a photo . . . or has she fallen in ? 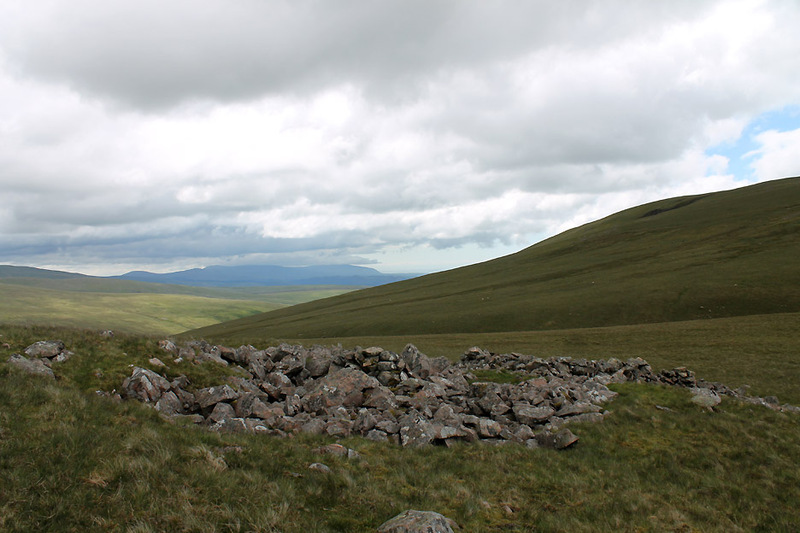 On the top of the western slope is an ancient tumulus . . . now adapted to provide shelter from the prevailing westerly winds. The panorama this time is not actually from the summit but from the shelter. 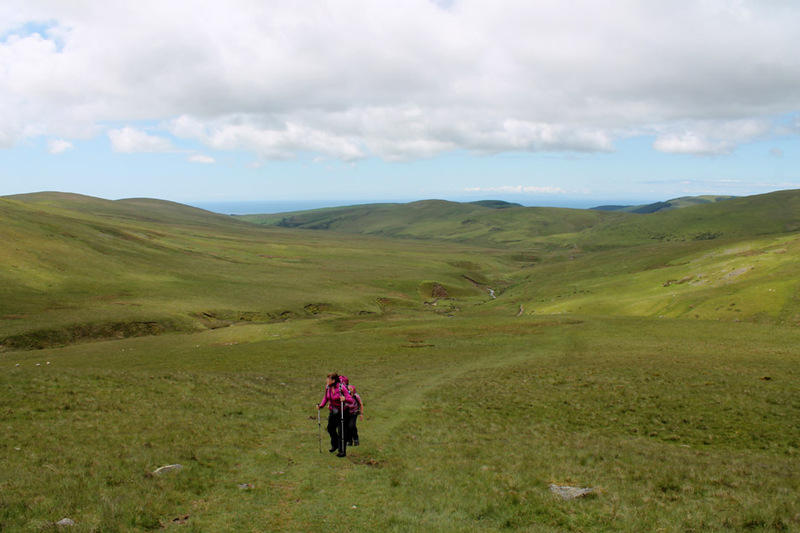 From the summit of Lank Rigg to the summit of Snaefell on the Isle of Man is 45 miles . . . as the seagull flies. As we leave the shelter the view across to Black Combe shows us a change of cloud level. 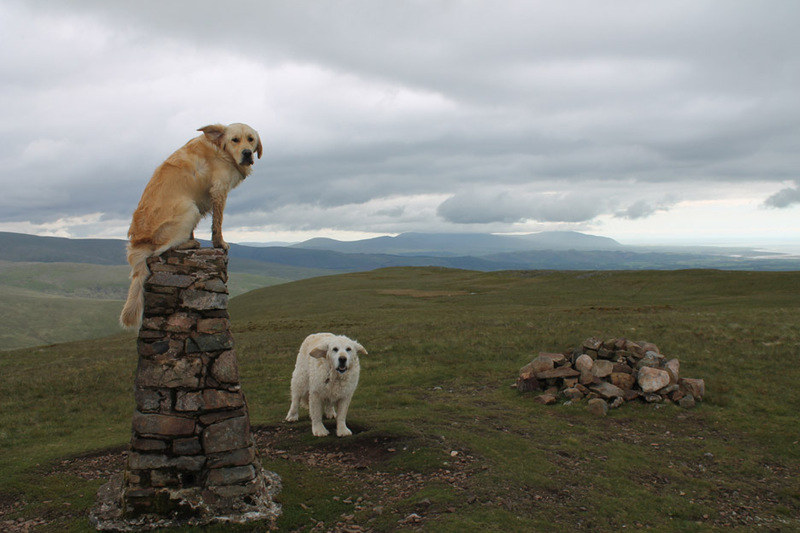 The summit has gone, hidden by a cloud base of around four or five hundred meters, which formed out beyond the western edge of the fell. The way ahead is plain to see . . . follow the grassy slope down then aim for the diminutive Blakeley Rise in the centre. Try and avoid the reeds and rushes again (he light brown colours), as they indicate damp ground. That's easier said than done . . . down in the valley the flat ground just holds the water. The shorter grass in the foreground is due to a drainage ditch just ahead of Nigel. The ladies tread carefully . 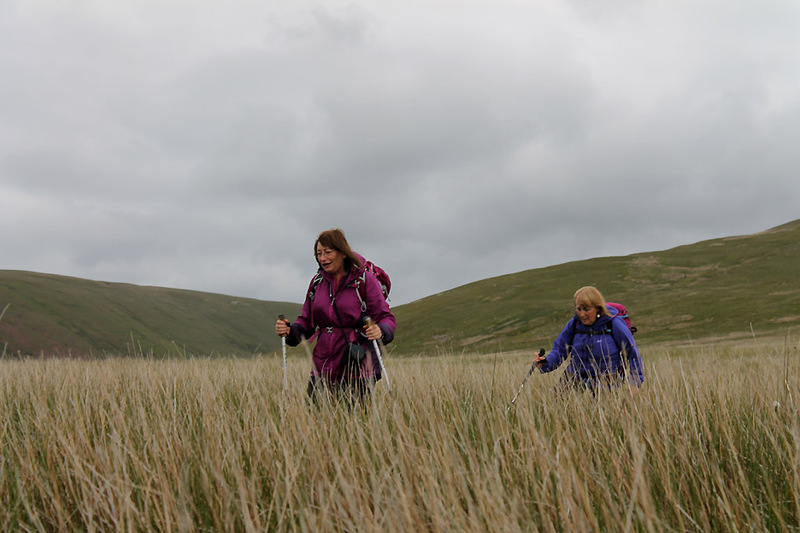 . . taking advantage of the firm tussocks in order to keep their boots dry. 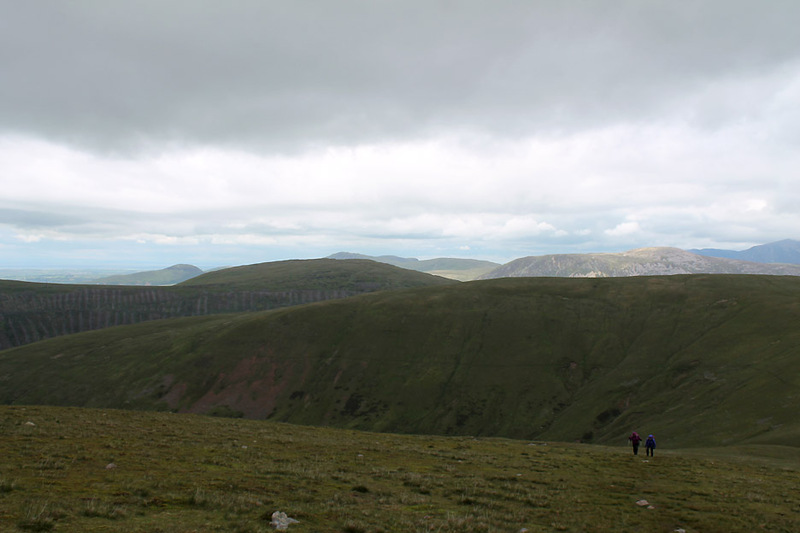 A final look back at Whoap and Lank Rigg after a fine four hour walk. We just need to top out on the rise . . . the car is just a short way ahead. Take care crossing the road at rush hour . . . 4 pm and the end of the day shift at Sellafield. A local tractor and trailer travelling fast but keeping to the 40mph speed limit has just passed. The traffic queue behind him stretched as far as the eye can see. south side of the R. Calder was "switched on" by the Queen in October 1956.
as the names have changed several times over the years. RmH. This site best viewed with . . . tea and home made cake back at Hollins Farm.